Intel has unveiled its next generation of microprocessor technology, code named Ivy Bridge. 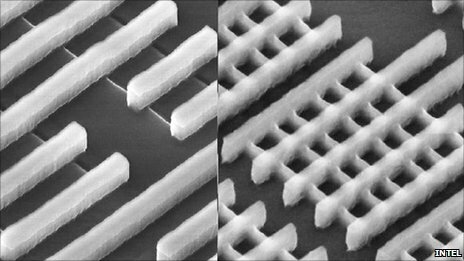 The upcoming chips will be the first to use a 22 nanometre manufacturing process, which packs transistors more densely than the current 32nm system. Intel said it would also be using new Tri-Gate “3D” transistors, which are less power hungry. Rival chip manufacturers including AMD and IBM are understood to be planning similar designs. 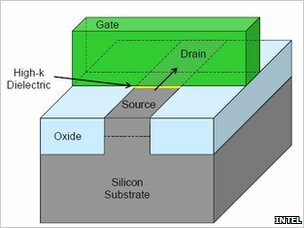 The announcement marks a significant step forward in the commercial processor industry, which is constantly striving to build more transistors onto silicon chips. One of the main measures of its progress is the length of the transistor “gate”, measured in nanometres (1nm = 1 billionth of a meter). A human hair is around 60,000 nm wide. Current best microchip technology features a 32nm gate. It has been known for a long time that 22nm technology would form the next stage in the evolution of microprocessors. However, the exact nature of Intel’s offering has been a closely guarded secret, until now. The company expects to begin commercial production later this year. 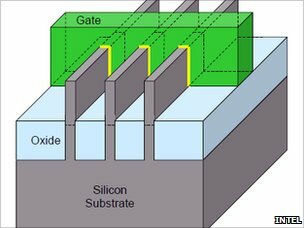 Kaizad Mistry, Intel’s 22nm program manager, said that the arrival of Tri-Gate transistors would make a big difference to consumer products. “What it enables in the market is improved power efficiency – so better performance for the same battery life or longer battery life for the same performance,” said Mr Mistry. In microprocessor design, a conducting channel passes through a switching gate which opens or closes – changing the output from 0 to 1. Until now, those channels have been “planar” or flat on the silicon wafer. Intel’s Tri-Gate system replaces the channels with 3D “fins”. Mr Mistry explained that the extra surface area made them more conductive, and able to work better on lower power. 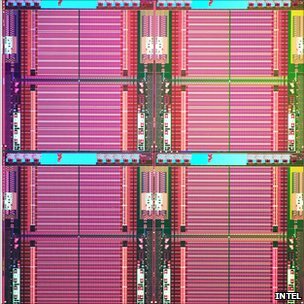 Semiconductor industry analyst Dan Hutcheson from VLSI research told BBC News that the new process would secure Intel’s market dominance. “It leaves them in a very powerful position,” he said. Mr Hutcheson added that the innovation in 3D architecture would not only benefit Intel’s desktop processors, but the chips it manufactures for mobile devices. “This is going to make their Atom line a lot more competitive with ARM.” UK-based ARM Holdings is the leading designer of low-powered mobile processors. The Ivy Bridge design allows approximately twice as many transistors to be crammed into the same space as on 32nm chips. That improvement is consistent with Moore’s Law – the observation made by Intel co-founder Gordon Moore that chip density would double every two years. However, Intel, like other chip manufacturers, is getting closer and closer to certain physical limits which may prevent that from continuing. The next chip manufacturing process will be 14nm, followed by 11nm. Atoms are typically around 0.5nm wide. Kaizad Mistry believes that the current rate of growth will continue for some time. “Gordon Moore himself said that no exponential is forever, but he would like us to delay that for as long as possible,” said Mr Mistry. “I have been in this industry since the mid-80s. At that time people were talking about the sub-micron barrier. There is always talk of a barrier.” Mr Mistry said that new innovations would keep processor design moving forward. Intel currently accounts for around 80% of global microprocessor sales, according to market analysts IDC. Its nearest rival, Advanced Micro Devices (AMD) has a 19% share. AMD was the first to produce a prototype 22nm chip in 2008. It is widely expected to pursue a similar fin-based system to Intel, known as FinFET. However, the company has yet to announce its plans for a commercial product. AMD spun off its chip fabrication arm in 2009, creating GlobalFoundaries. Mr Hutcheson said that the separation of design and manufacture had damaged AMD’s ability to innovate. “There is a huge competitor advantage to having your own fab [fabrication facility] and being able to tune the process. “This is Intel pulling away,” he said.